The grey jumpsuit: It’s not a fashion statement, it’s a lifestyle. Auburn powered through another spring practice Monday morning, donning full pads (but not hitting) as the second week of spring camp began. Post-practice, Gus Malzahn and select players were made available, touching on a wide, wide range of subjects. It’s going to be a mixed bag today. Practice today. Malzahn said that the team did essentially the same thing it went through on Saturday, just without tackling. The team is allowed eight practices with tackling this spring, and they’ve used one. They did go 11-on-11 in some “situational work” toward the end of practice, though. 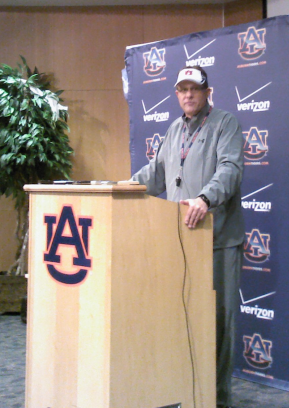 “It was pretty much kind of what we thought,”Malzahn said. “We were going at a very fast pace. There were some mistakes. It was pretty much offensively and defensively what we thought. The Tigers will return to practice on Wednesday, in full pads once again. The Star back. For the first time this spring, junior Justin Garrett spoke. He’s competing with redshirt freshman JaViere Mitchell for a job at the new linebacker/safety hybrid position. It wouldn’t be a No-Huddle Notebook without taking a look at that Star back and the 4-2-5. Garrett took time Monday to explain the position from a player’s perspective. “You can do multiple things,” Garrett said. “The Star position will blitz a lot and roam around to give the offense a hard time figuring out what we’re doing in our defensive scheme. Garrett said that when the Tigers play a pro-style offense, he can come in and fit as a third linebacker. When they play a spread team, he fits more like a nickel. “It’s just a mixture,” Garrett said. LaDarius Owens is back at linebacker. And, he admits, it’s kind of what he’s been wanting to do this whole time. But LaDarius is taking that temporary stay at defensive end in stride, saying that it helps to just learn the system for the first time, instead of transferring over and have to forget the last system like the other linebackers. Owens also said all of that practice on the defensive line helps him get past linemen now from the linebacker spot. “Everything happens for a reason,” Owens said. “Me being at end helps me deal with linemen really easy. It got me to adapt to it, just like Saturday when we had our first scrimmage, we did inside drill. But Owens said he means business now that he’s back at linebacker. He’s shooting for the starting spot, and if he gets it, he’s plenty confident in being able to ‘quarterback’ the defense from the Mike position. “I didn’t move to linebacker to watch or to just add depth,” Owens said. “I want to compete. And that’s why I put in so much time off the field to study and watch film. If there’s anything we can take from last season’s 3-9 campaign, it’s that the linebacker spots are wide, wide open for anyone to take. Previously: No-Huddle Notebook: Tempo, pads, and tempo, No-Huddle Notebook: Happy New Year!, No-Huddle Notebook: It’s another New Day, again. Is that a grey Under Armour sweatsuit that Gus is wearing? I think the boys at UA have lost it. I’m scared to see what the coaches will be wearing on the sideline this year. Better than those ‘shackets’ that Chizik wore over the past couple of years.